Most of the time, when you think of Vitamin C, you probably think of orange juice and remedies for preventing and treating the common cold. But did you know that Vitamin C is also a beneficial topical treatment for your skin? This new, highly concentrated form of Vitamin C is said to decrease skin blemishes and discolorations, lead to brighter skin, and diminish the appearance of wrinkles and fine lines. Dermatologists cite the effectiveness of a Vitamin C facial serum to stimulate collagen, improve elasticity, and prevent or repair skin damage. What Are The Benefits of Using a Vitamin C Facial Serum on Your Face? Vitamin C serums work because they contain powerful antioxidant properties that protect skin and promote beneficial healing. These serums also contain key enzymes that produce skin pigmentation. Other skin loving ingredients include gentle, ascorbic acids, all-natural cucumber fruit extract, ginseng extract, aloe vera gel, collagen, and flower extract oils. It’s a safe and non-toxic formula makes it ideal for everyday use. It’s a simple oil and water based liquid packed with highly concentrated amounts of all-natural Vitamin C. The high concentration of Vitamin C in serum forms produce significantly higher results than comparable Vitamin C creams and lotions. The chemical-free, natural ingredients found in Vitamin C serums work in concert to give increased collagen production that plumps, hydrates, and brightens skin. You’ll also see many, if not every single one, of the following benefits. You’ll have younger-looking skin and a more youthful complexion due to its anti-aging properties. Sunburns will heal faster and inflammation and unwanted puffiness will be greatly reduced. Increased collagen production means your skin will look plumper and help rid itself of fine lines and reduce wrinkles. It also helps protect your skin against harsh UVA and UVB rays from the sun. You’ll eliminate the appearance and production of dark circles under your eyes and tired looking eyes. Skin discolorations will be greatly reduced giving you a smoother, more even-toned complexion. Increased hydration and healthy moisturizers help your skin feel more supple and banishes dryness and flaking. Its antioxidant properties mean your skin actually begins to fight impending damage and repair existing damage. The Vitamin C found in citrus fruits and their juices and extracts act as natural exfoliants. They’re also safe for even the most sensitive skin. The best way to administer your C serum is to apply it under makeup once or twice daily to clean, dry skin. Naturally occurring citrus acids also help prevent stretch marks and help keep your skin firm, younger looking, and younger feeling. Free radicals are a molecular structure created when your skin and body metabolize oxygen into energy. A single, rogue electron can turn into a free radical due to harmful UV rays from the sun. Free radicals come in three forms: Reactive Oxygen Species (ROS), Reactive Carbonyl Species (RCS), and Reactive Nitrogen Species (RNS). These free radicals can roam your body and cling to healthy cells causing premature aging and, in extreme cases, can turn into carcinogens. The beneficial concentrations of antioxidants in Vitamin C serums help protect healthy cells and turn free radicals into harmless molecular particles. 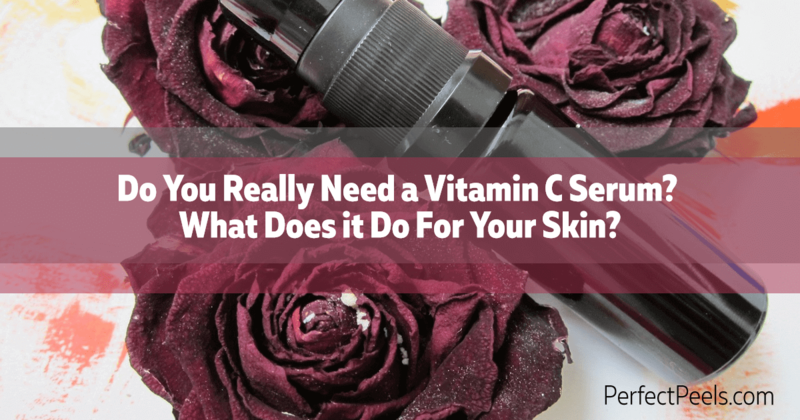 Vitamin C skin serum is especially good for you if you tend to suffer from dry skin. Its natural exfoliants gently remove dry, flaky skin while its hydrating properties plump and moisturize your skin. There’s another amazing benefit – hyperpigmentation (commonly called brown spots), are also seriously diminished or eliminated. That happens because concentrated Vitamin C found in serums halts the overproduction of the pigment known as melanin. This brightening effect takes place because Vitamin C inhibits the production of the enzyme, Tycosinase, which causes skin discolorations like brown spots and sun spots. The serum can also help reduce or eliminate unsightly acne and acne scars. The high concentrations of Vitamin C in these beneficial serums also have serious anti-inflammation properties. When inflammation occurs, you get itchy, flaky, ugly rashes, and red skin. Vitamin C serums work hard to eliminate inflammation and reducing scarring and discomfort. It gently enriches and strengthens blood vessels and reduces the appearance of dilated blood vessels and broken capillaries. Can Your Face Really Benefit From a Vit C Serum? Try adding a Vitamin C face serum to your regular beauty and skin care routine. It will give you a plethora of amazing, fell-good benefits. It evens out your skin tone and protects your skin from the hazards of environmental pollution, considerably improves skin’s hydration, and keeping your skin looking and feeling younger. You’ll love those benefits and more including clearer, more supple, even skin, protection from the sun, and improved moisture. And you’ll love the radiant, new skin Vitamin C Facial serum reveals. You’ll also love the way your skin looks and feels and your skin and your mirror will thank you.